This is apart of the series "Let's Go Camping"- discovering new campgrounds in and around Switzerland. When hubby suggested we head to the south of France for spring break I was all ears! After a long, grey winter, sunshine and the beach were calling my name. But when he described splitting our time between campgrounds by the beach and the mountains let’s just say I was less than enthusiastic. For me, the south of France means beaches not mountains. (Don’t we have those tall rocks here in Switzerland already?) But since marriage is all about compromise, I agreed to divide up our week into 4 nights at the beach for me, and 3 nights in the mountains for him. And boy am I glad we compromised. His campground of choice? Camping Nature Parc L’Ardéchois in Vallon Pont d’Arc. 1. Tell us about your campground and the best way to get there. Camping L’Ardéchois is located in a valley of the Rhone alps on the outskirts of the town of Vallon Pont D’Arc. 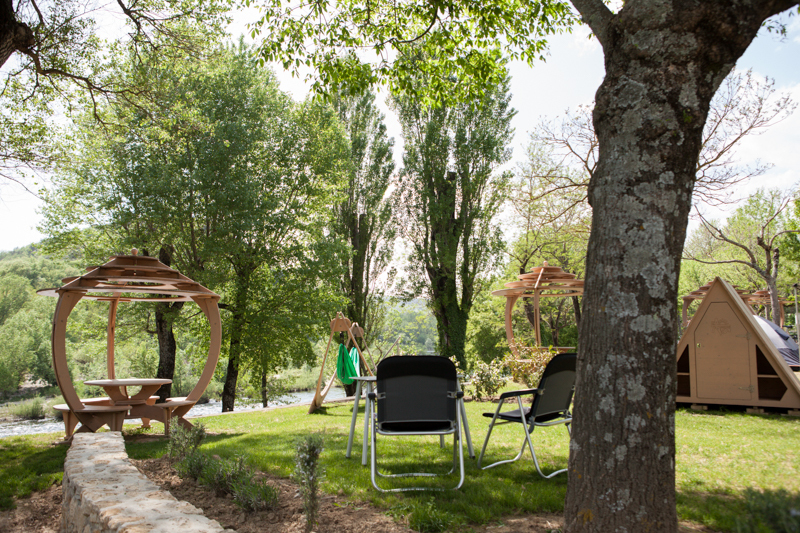 Visitors to this area will find themselves getting back to nature, either by walking through the surrounding lavender fields in the summertime or cruising down the Ardeche river in a canoe. You can best reach the area by car and it’s a 3 hour drive to the border of Switzerland via Lyon or Grenbole. 2. What types of accommodation are on offer? On this trip we decided to rent a mobile home on site. There are three rows of what looked like brand new or extremely well looked after mobile homes in the middle of the grounds. Every effort is put into decorating them and ours made us feel right at home. A nicely covered balcony was the setting for our breakfast each morning as well as our evening Rummikub games. The light and airy mobile home fit our family of 5 well, two bathrooms, a bunk bed with roll out bed underneath as well as the double bed for us adults. Other options on site are to bring your own tent, caravan or van, or you can rent a safari tent (privately via Eurocamp). The pitches were all a generous size, with the minimum being 100 square meters—no tight living quarters here. If you want to go for the luxury version of 150 square meters, these pitches include a wooden seating area, a refrigerator, once daily use of the dishwasher as well as a hammock for laying back after a hard day on the river. And for those that book early enough, reserve one of 8 sites looking over the river at a size of 160 square meters. We visited during the last week in April and the campground was barely half full. The weather was perfect, with the temperature getting up to 26-27. 3. What facilities does the campground offer? This is a 5-star campground with great facilities. Two well maintained and very clean bathroom areas have recently been built and include a cute family area called “Grotte Chalvet” which are also heated during the colder months. Even the family dog isn’t forgotten with it’s own room for a bath. Have a caravan or motor home? There is an area to give your van a wash as well as a nifty machine that will not only wash out but clean your chemical toilet (for an additional fee). The campground has one restaurant which serves local dishes as well as well pizza. There is also a nice lounge area to enjoy a drink. The small onsite shop had plenty of wine as well as the standard baguettes and croissants. 4. What actives does the campground offer? Despite being a smaller campground there is still plenty to do. There is also a wellness area for the adults including a hamam, sauna, jacuzzi, and ice fountain. as well as a tennis court and ping pong tables. During peak season there are also kids activities run by the animation team. 5. Breakfast, lunch and dinner: what are your recommendations? We ate breakfast daily on our balcony with bread and croissants from the onsite shop. For lunch we always tried to find a place to enjoy a crepe or galette - our favourite was in Vallon D’Arc where I enjoyed a galette with goat cheese and candied chestnuts. We visited the market on Thursday and stocked up with in-season strawberries, the sweetest oranges I have ever tasted and delicious saucisson - don’t call it “salami” here! Visit the most adorable bakery in town along the main road - you can’t miss it. While the lemon meringue tart wasn’t sour enough for me, everything else we tasted here was delicious including the baguettes, croissants, donuts and quiches. I’m starting to get hungry just writing this. We had our first dinner on site at the campground where hubby enjoyed some nice fish and I indulged in a steak with pepper sauce. But the limited choice wasn’t enough to convince us to eat there twice and so we tried two restaurants in town. One was a more tourist style restaurant but hubby loved the fish he ordered and one just across the way called Le Coconut, where I had amazing lamb shanks. Having picky kids can make meals times a challenge so we didn’t visit the restaurants that looked like they would have appealed more to us than our kids. Steak hache (hamburger meat) seems to be the standard kids meal on offer. 6. What to see and do outside the campground? This beautiful part of France are for those looking to enjoy everything nature has to offer. We visited the towns of Vivers for is medieval centre but wouldn’t recommend a visit. It was like a ghost town and only worth a visit if this sort of architecture interests you. We also had lunch on Montélimar which just like any other city in France - great for shopping (just remember most shops in France close between 12 and 14/14.30) but not much else. For raining days consider visiting Caverne Pont D’Arc which is a replica of the Chauvet Cave. It’s best to book ahead as there is a limit as to the number of people are allowed in at one time. A Canoe tour down the river Ardèche is highly recommended and something our older two will always remember. With both never having canoed before hubby and the two older kids (min. age is 7 so Z stayed with me) joined a guided tour along the river. We used the company on site at the campground. 7. Any tips on what not to forget? Pack sheets, towels, and pillows if staying in a cabin. Although disposable sheets are provided I much prefer the feeling of cotton sheets so I wished I had brought my own. Pillows are provided but are very thin, so if pillows are as important in your life as they are in mine, bring your own. Scooters for the kids. Campgrounds are best explored by scooter! Your own shopping bags - 2018 brought in a plastic ban into France - go France! - and so join the plastic free revolution and bring your own shopping bags! GoPro - I wish I had brought ours. It would have been great to capture the canoe trip! 8. Best way to book? Book directly with the campground. We booked the night before so we gave them a call to make sure they received our enquiry. 9. Anything to watch out for? Swimming Shorts are not welcome in French pools and this campground is not an exception. So make sure you bring along those lycra Speedos you dread to wear. 10. What sets this camp ground apart from the rest? Size and location. It is so refreshing to visit a campground that you can easily walk around, and where they aren’t trying to fill every spare square meter with another tent or caravan. The plots are more than generous and well manicured. However we visited in low season, I would be interested to see how it feels in high season. The location next to the river is also a highlight. After dinner we would stroll down to the river to enjoy sunset with the kids throwing in sticks to see which one would make it down the river first. We really enjoyed our time here and plan to revisit when little Z is not so little anymore. There is so much to do from around the age 7 or 8, when they have become more confident swimmers, so we will plan to revisit in a couple of years. Do you have a favourite campground to recommend to the Simple Family Travel community for the series "Let's Go Camping"? We would love to hear from you! No campground is too small, no campground to luxurious!